Hot water heaters come in a variety of options: different manufacturers, energy type, tank or tankless. At Double D Plumbing, we can aid you in selecting the best option for your home and making installation as easy as possible. Does your family have never-ending hot water wars? If so, it’s time for a tankless water heater! The concept of a tankless hot water heater is simple. The cold water supply runs through a heating unit and is continually warmed as long as you need it. The water is only warmed when you need it, saving on energy costs. We proudly provide installation and service for Rinnai, Navien, and Rheem tankless water heaters. 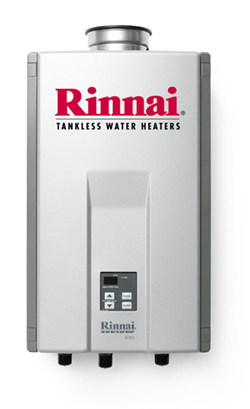 Rinnai has the #1 selling tankless water heater in the country. The superior thermal efficiency of a Navien tankless heater means lower utility bills and more money in your pocket. With the purchase of a Rheem tankless heater, possessing a 94% efficiency rating, you can feel confident in saving energy while experiencing a continuous flow of hot water. Tankless water heaters are great home investments. Imagine an endless supply of hot water for your family and lower utility bills! Natural gas water heaters are cost effective, reliable and efficient. Double D Plumbing employees are the licensed trusted professional plumbers to install and maintain your gas water heater. We proudly provide installation and service including, but not limited to gas water heaters from: A.O. Smith, Rheem, Rinnai and State Select. Electric water heaters are one of the most common and popular water heating options. They are simple to install, easy to handle and free of fuel combustion. We proudly install and service electric water heaters from, but not limited to: A.O. Smith, Rheem, Riannai and State Select. Double D Plumbing provides material and labor warranties on all selections for your "hot water supply".